When you look at Mina Markovic and Jain Kim, you might think they have a lot in common. They are both tiny and light, they are both excellent lead climbers and they have what it takes to do well in boulder competitions too. Starting from 2010, they have been on top of the female lead World Cups with a level of consistency that most athletes of either gender would dream of. However, when you see them climbing, it’s a different story. Jain flows with grace and fluidity, only occasionally interrupted by a sequence that requires her more than an instant to figure out. Mina, instead, powers through the routes and goes on fire where most people just burn out. You could say that they are like night and day, or like fire and water. But again, there’s more to these two athletes and their climbing than meets the eye and therefore, true to our spirit, we wanted to hear what they have to say about themselves and their performances and we met them straight after the semifinal in Kranj for a short (but double!) interview. Last year you were on the top two spots in 4 World Cup events out of 9 events. This year, 5 out of 8 events. Your performance was even stronger than last year. What was different for you? Was it a different preparation or just the way you converted it into performance? Mina: Speaking for myself, I felt better prepared physically than last year. Also, all the experience comes together and you feel more comfortable which, together with being stronger, helps you perform better. Jain: It’s strange for me to say, but it might have been the injury I had in April (at the bouldering WC of Millau), I injured my right knee. It was a very hard time for me, but I just focused on getting better and enjoying the climbing I could do. While the knee was recovering I trained mostly on my upper body, maybe that made the difference for this year! What did you think of the route setting this year? Did you like it? Jain: Yes, I did. Here in Slovenia we always get a very hard route, which takes the best out of me. I especially liked Valence too, the final was a very hard route with many boulder moves. I tried to enjoy my climbing. Mina: It was a lot of different styles this year. Like Briançon was maybe a little easier and more slabby, other routes were more technical. In Korea the routes were very long and in Imst too and very intensive. Valence was again something different and now Kranj is really hard. I think we had a great variety of styles. Next year we’ll have the World Championships, the only completely international title that neither of you has yet won. How do you feel about this challenge? Mina: I am definitely excited about it : ) If there’s one thing I want to win, that’s the one. Jain: In the World Championship I got the second place three times. So I’d like to be first but I’ll really want to try and enjoy my climbing. Are there any countries you would like to visit thanks to a climbing competition? Jain: I’ve never been to England so that I’d be interesting for me. Mina: Maybe Australia, or somewhere in Northern Europe. What are the things you miss the most when you are travelling? Mina: I don’t know. Sometimes I actually regret that we don’t go to visit cities although we are doing it when we have a few competitions in Asia and we get to see places. It’s very enjoyable so it’s distracting. Jain: We have so many competitions and we travel so much in a season, which keeps you interested in things. It’s important to concentrate on the competitions anyway and I think it’s good to visit many countries. Sometimes we have the chance to just travel in that coutry and I like it. A great sportsman, whose career was characterised by a major rivalry, said the following about his historical opponent: “Without him, I would have gone down in history as a better player, I would have won more. But I would be less”. Do you feel something similar about each other? Mina: I definitely like that we are strong climbers in our circuit. We push each other further, we train harder, we improve on our weak points, we just try harder and get stronger. I think it’s really nice. Jain: Yes, it’s the same for me. I like what Mina gives me, she makes me a better climber. In the end, the final climb this year was a difficult one for Mina and Jain, as they knew that the seasonal title was at stake. They didn’t climb their best and ended up third and fourth respectively, with Jain winning the overall lead title for the year for the second time after 2010. Mina can still be proud of an excellent season in which she won the Rock Master for the first time, the World Games and the overall title for Lead, Bouldering and Speed. Here is their head-to-head record for the last four Lead World Cups. This leaves only 7 events that were won by somebody other than either of them excluding the 2011 ties (21%) and this last WC in Kranj was the only occasion this year. 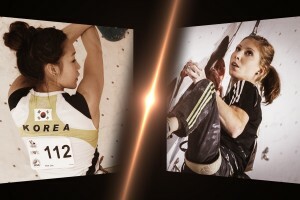 Below, the replay from IFSC TV of the final in Mokpo, South Korea, where both Jain and Mina managed to top every single route. Mina got the first place, however, as she climbed the final faster. Click the video below to see Jain climb. Mina starts climbing at 1:58:13. All the video coverage for this year is available through the excellent YouTube channel of the International Federation of Sport Climbing. Return to the Rest Jug homepage by clicking here. Liked this article? Let us know by liking our facebook page!